December - Time to start planning next year's family budget. I thought I'd share how our family plans our annual budget as a practical and hopefully helpful blog post. A budget is not something we often think of when imagining the life of a missionary, but as a missionary it's definitely needed! We get finances once a month and have to make that stretch. A little background first. Before I gave my life to Jesus, these budgeting concepts were foreign to my husband and me. As a matter of fact the first year of our salvation, we lost our house and our car due to bad financial decisions. We had a bank account but never balanced our check book...just looked at our ATM balance and went from there. Can you say bad idea, lol! Neither of us are from prosperous backgrounds or even from middle class America. Although my husband does come from a hard working background, I don't. We first started learning about budgeting when Pastor Gordon asked Pastor Andy Anderson to do a financial seminar for us in Corpus Chrsiti, TX (Where we got saved). It was a real eye opener for us and really helped us. Pastor Anderson went over all the budgeting forms and so forth, but what was so helpful was the preaching that accompanied the practical helps. Since then, I've read countless books including ones from Larry Burkett and Dave Ramsey which I encourage everyone to do as well. When we lived in the U.S., I made up this form. If you click on the link or the picture you can download it and use it for yourself. That form is for a yearly budget with weekly paychecks. I don't use that anymore as we are now on a monthly budget. However if you are on a weekly or semi-weekly budget the excel spreadsheet is the way to go as it does all the math for you. It's based loosely on Dave Ramsey's idea of having your money allocated before you get it. The following is based on keeping our budgeting simple and quick. Instead of a computerized budget I now use a simple notebook. The basic concepts are the same, so it will work on computer or paper. First I title the 1st page "Savings 2014" and title the second page "Monthly Expenses". Then I turn to the 3rd page and title it January 2014 and do that with the consecutive remaining months for the next 11 pages. Immediately after "December 2014", I start titling the pages "Grocery List Week 1" and continue for 52 pages until "Grocery List Week 52". Next we pray about what God would like us to give to support conference, give to world evangelism (at conference & our church), for revivals, birthdays, Christmas, our anniversary, and any other needs we might have. The reason we start planning now for conference is that when we 1st got saved we heard an offering illustration at conference one year that never left our memories. The pastor said something to the effect that if you are sitting here wishing you could give but you don't have any money it's all the times during the year you should have been setting money aside that are to blame. We hated the inability to give when our hearts were so moved! Once we have a base number for everything we need to save for, we then determine the dates we will need the money available. So for example our anniversary is in March. We divide the amount we determined by 3. For conference it's 10 because our conference is in October. We continue down the list for every item. Next we go to the second page and write down our income and expenses and a general estimate if it fluctuates like the electricity bill. Now we have a general idea if we can afford all that we want to do. If we can't we rework the numbers say for birthdays or stuff like that. The general budget is done. Now before every month begins we turn to the appropriate page and write down our income at the top and start subtracting expenses such as tithe, offering, W.E., savings, rent, and so forth. 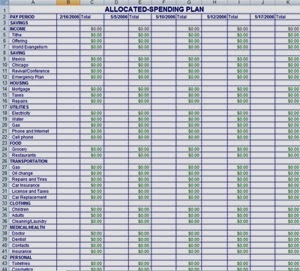 Very similar to my income allocation sheet but on paper and only 1 column because we only get money once a month. By this time we have the electric bill and other bills that fluctuate so it's more accurate than the general budget. 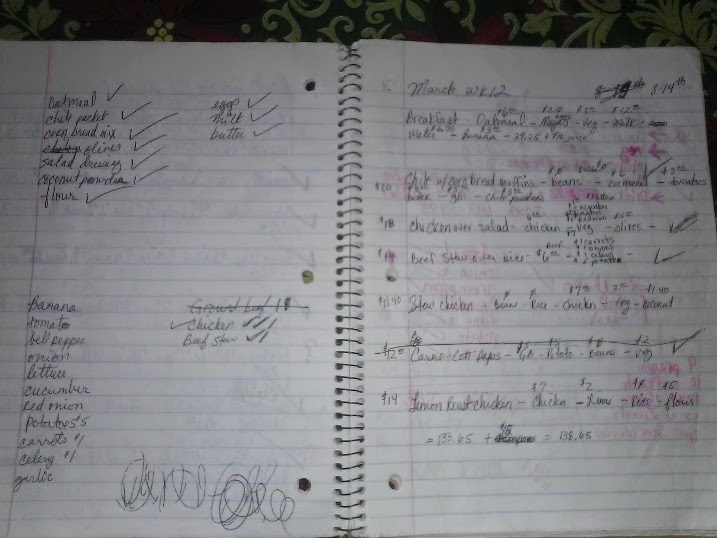 I make a second column for groceries and write the weekly dates. For instance in January, I would write 1/2/14 on first line then 1/9/14 on the second line and so forth. Next to each date I write amount we will have available for groceries. The way we determine available amount for groceries is by dividing whatever is left after expenses and savings by 4 or 5 depending how many weeks are in the month. Sometimes it's not very much so that is where the weekly grocery list becomes very important. I then turn to the weekly grocery list and make a list based on amount of money available. Since I have an Android phone I then quickly type my grocery list into my Google tasks, so I don't have to take the notebook with me. Numbers might seem high bcuz our money is 2BZ to 1US. When it comes to finances as in other areas of life remember most things are a trade. Before I buy something impulsively , I ask myself "What am I trading this for?" When it seems easier to eat out than to cook ask yourself, "What am I trading this for?" I'm sure there are many more tips, but this post is really long already! :-) If you have any tips, ideas, or questions please leave them in the comments below. God Bless! Thanks for this post! It'll come in handy for us soon! Your welcome! Praying for you guys...Brazil for Jesus! Thanks for sharing those ideas, Melissa! 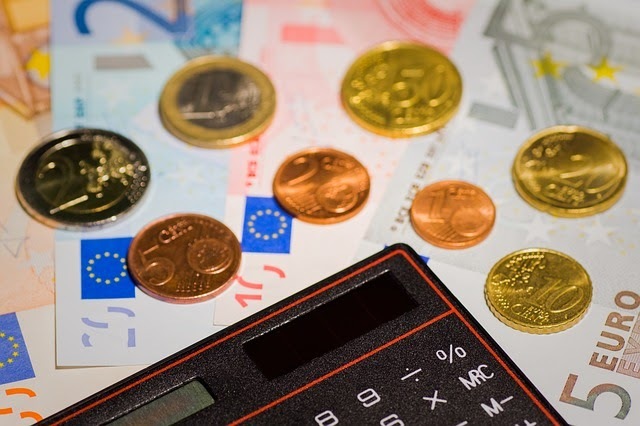 It might look easy at first glance, but budgeting can be quite tricky. You have to project an estimate for each variable, and make sure you can meet at the end of your target time. Another thing is that you also have to be focused on achieving your goals once they were set. Good luck! Thank you so much for this. We are missionaries who are in the States while my husband finishes school. I could teach school and make more money, but instead we are marketplace chaplains...basically missionaries in companies around town. Our income is fairly consistent, but also fairly low. We are doing Dave Ramsey's Every dollar and Baby Steps to manage things, but I like the "pray first" advice you give. Dave seems to leave that out and at times I've felt we are getting ahead of God. I'm going to show this post to my husband. I think it will really help us. God bless your work in Belize!